When the inhabitants of marseille came into conflict with the local Celts in the second century BC, they appealed to Rome for aid. The Romans arrived in force in 122 and soon conquered an area around the Gulf of Lyon, which they called the Transalpine Province - the province on the other side of theAlps from Rome. (The name Provence, northeast of the Languedoc, is a vestige of the time that this was Rome's only Province). From 118 BC Narbonne was the capital of Roman transalpine (narbonnic) Gaul. In what is now the Roussillon, Ruscino became a roman colony in 120 BC. The now indigenous Celtic peoples - Volques and the Sardones - preserved their traditions, costumes and language through Roman times. Chief of the Roman Legions was Cneius Domitius Ahenobarbus, who organised his new province around a communication axis, running inland from the coast. This route had been known to the Greeks. To them, this was the way that Herakles (Hercules) had returned to Greece from the pillars we still know as the Pillars of Hercules on each side of the Strait of Gibraltar. It was known as the Heraclean Way. The Roman road, which still exists in parts, is named the Domitian Way (Via Domitia) after Cneius Domitius Ahenobarbus. This is the oldest Roman road in Gaul, and one of the oldest anywhere. It runs from one end of the Languedoc-Roussillon to the other, only 15 miles or so from the sea, providing an easy way to explore the region's landscapes and history. Connected by continuing roads at each end, it linked Rome in Italy to Cadiz in Spain (500 km) and is part of an immense road network of more than 70,000 miles, built by the Romans over eight centuries. In places there is much of the original construction still visible in the Languedoc - the modern A9 runs along side it. For more information, click here . Unlike the Greeks, who had been interested only in trade, the Romans were full scale colonists, not only trading and road building, but also establishing a military presence, raising taxes, and recruiting auxiliary troops. Another Roman colony, Colonia Victrix Julia Septimanorum Baetarae, was founded by Julius Caesar. Today it is known as Béziers, and its inhabitants as Bitterois. It was Julius who defeated the Gauls - assisted by auxiliaries from the Transalpine Province. Confusingly for the modern French, these auxiliaries even fought against Vercingetorix at the critical battle in which Gaul became another Roman province. Publius Terentius Varro Atacinus (82 BC - c.35 BC) an early Roman poet, was born in the Province of Gallia Narbonensis, the southern part of Gaul with its capital at Narbonne, on the River Aude. His surname Atacinus (derived from Atax the Roman name for the River Aude) indicates his birthplace. Under the next Emperor, Augustus [27BC - 14AD], the the Transalpine Province was reorganised and renames the Narbonnaise after its new capital, Narbonne. Archaeological excavations have revealed a Roman amphorae factory close to Narbonne in Sall�le d'Aude. Amphorae and ceramics are known to have been exchanged with Cornish tin. Other cities flourished and grew, often near or around existing Celtic oppida. Many of the Roman jewels in Nîmes, date from this period. Nîmes was an image of Rome itself, studded with temples, baths and waterways. The famous Maison Carrée a, Roman temple, dates from this time. So does the equally famous Pont du Gard A spectacular well-preserved three tiered Roman aqueduct over the River Gard (or Gardon). At almost 50 meters in height it is the tallest the Romans ever constructed. It is part of the aqueduct built around the year 20 BC to transport water over 50 kilometers from the Eure spring near Uzès to the city of Nîmes. For more information, click here . An imperial mint in Nîmes coined money known and used throughout the empire. The as of of Nîmes is a bronze coin with a famous design of a crocodile (representing Egypt) chained to a palm tree. In the second century Nîmes would provide the empire with an emperor: Antonius Pius - best known to the British as the builder of the Antonine Wall north of Hadrian's Wall in Scotland. Livy (Titus Livius, 59 BC - AD 17) traded in non-sparkling white wines from Limoux. Wine markets flourished at Béziers. Carcassonne provided a link to the Aquitaine. Lodeve became a centre of mining. Narbonne overtook Marseille as an international port. Toulouse grew prosperous, a link between the Mediterranean Sea and the Atlantic Ocean. Like any good Romans the inhabitants of these towns lived in Roman villas, decorated their homes with frescoes and mosaics, prayed at Roman temples, frequented the Roman baths, watched plays at the theatre and attended games at the amphitheatre. 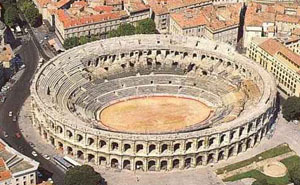 The Arena (Aréne) at Nîmes is today the best preserved example in the world, seating some 20,000 people, it still used regularly for games and spectacles that have also survived here from Roman times. The province was Roman in every sense - Pliny the Elder in his Natural History describes it as part of Italy, a description that made perfect sense at the time, but which disconcerts modern French who seem to regard it as an inexplicable error since, for them, the Narbonnaise must self evidently always have been French. There are reminders of the Roman names in many place names, often heavily disguised. Examples are Fa (Fanum - a temple), Fanjeaux (Fanum Jovis - Juputer's Temple), and Minerve (dedicated to the goddess Minerva). Other reminders of the Roman period are structures such as surviving Roman bridges, of which there are many in the Languedoc; roman republican symbols such as the fasces, the Liberty Cap and the goddess Liberty. The greatest reminder of all is the local language, now called Occitan, but traditionally known as "the plain Roman toungue" - of all the Romance languages, the nearest to the original popular Latin. In medieval times scribes would often switch seemlessly between Latin and Occitan, probably not even noticing what they were doing. The economy depended on vines, olive trees, fig trees, fishing, salt farming and mining: iron and precious metals in the The Corbières, the Montain Noire, the Rouergue, the Albigeois and the C�vennes; copper from the upper valley of the River Orb; lead from the northern part of the Hérault. Pottery was exported from the Banassac (Lozère département) and Montans (Tarn) and glassware from Nîmes. At the end of the Third century AD the Roman Narbonnaise Province was divided into three: Narbonnaise I, Narbonnaise II, and the Viennoise (around Vienne). Narbonnaise I corresponded roughly to the part of original Transalpine Provence lying west (right bank) of the River Rhône, Narbonnaise II included what we now call the Dauphine and Provence, and the Viennoise the part of the original Transalpine Provence lying to the east (left bank) of the River Rhône. By the end of the fourth century the Roman Empire in the west was falling apart. In the early years of the fifth century the Visigoths, led by Alaric, an Arian Christian, took Rome. Soon Alaric had established a Visigothic Empire stretching from southern Spain to northern France. Narbonne fell to the Visigoths in 413 AD.